Nine Books of Chilam Balam are known,2 most importantly those from Chumayel, Mani, and Tizimin,3 but many more have existed. Both language and content show that parts of the books date back to the time of the Spanish conquest of the Yucatec kingdoms (1527-1546). In some cases, where the language is particularly terse, the books appear to render hieroglyphic script, and thus to hark back to the pre-conquest period. The Books of Chilam Balam give us the fullness of 18th-century Yucatec-Mayan spiritual life. Whereas the medical texts and chronicles are quite matter-of-fact, the riddles and prognostications make abundant use of traditional Mayan metaphors. This holds even more true of the mythological and ritualistic texts, which, cast in abstruse language, plainly belong to esoteric lore. The historical texts derive part of their importance from the fact that they have been cast in the framework of the native Maya calendar, partly adapted to the European calendrical system. Reconstructing Postclassic Yucatec history from these data has proven to be an arduous task. The following is an overview of the sorts of texts - partly of Mesoamerican, and partly of Spanish derivation - found in the Chilam Balam books. Histories, cast in the mold of the indigenous calendar: migration legends; narratives concerning certain lords of the indigenous kingdoms; and chronicles up to and including the Spanish conquest. Prognostication, cast in the framework of the succession of haabs (years), tuns (360-day periods) and katuns (20X360-day periods). Prophecy, ascribed to famous early 16th-century oracular priests. Collections of riddles, used for the confirmation of local lords into their offices (the so-called ‘language of Zuyua’). Classifications according to the twenty named days (correlating birds of tiding, plants and trees, human characters, and professional activities). Treatises on astrology, meteorology, and the Catholic liturgical calendar (the so-called reportorios de los tiempos). The astrology is Ptolemaic and includes the European zodiac. Roman Catholic instruction: feast days of the saints, tracts, and prayers. Spanish romance (genre), such as the tale of the ‘Maiden Theodora’. Since many texts recur in various books of Chilam Balam, establishing a concordance and studying substitution patterns is a basic part of the scholar's work. The archaic Yucatec idiom and the allusive, metaphorical nature of many texts present a formidable challenge to translators. The outcome of the process is sometimes heavily influenced by external assumptions about the texts' purpose. As a result of these factors, the quality of existing translations varies greatly. Kaua (Bricker and Miram 2002). An excellent overview and discussion of the syncretism involved is to be found in the introduction to the Bricker and Miram edition of the Book of Chilam Balam of Kaua.7 A sophisticated analysis and interpretation of the mythological and ritualistic texts has recently been given by Knowlton (2010). Bricker, Victoria Reifler and Helga-Maria Miram (translators) (2002). An Encounter of Two Worlds: The Book of Chilam Balam of Kaua. Middle American Research Institute,publication 68. New Orleans: Tulane University. ISBN 0-939238-98-5. Clendinnen, Inga (1987). Ambivalent Conquests: Maya and Spaniard in Yucatan, 1517-1570. Cambridge Latin American studies, no. 61. Cambridge and New York: Cambridge University Press. ISBN 0-521-33397-0. OCLC 4356013. Craine, Eugene R., and Reginald C. Reindorp (translators) (1979). 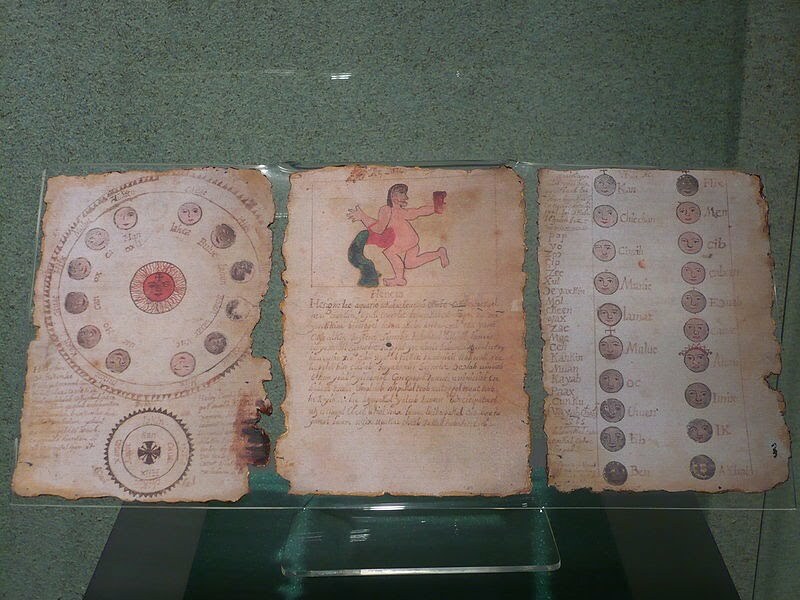 The Codex Pérez and the Book of Chilam Balam of Maní. Norman: University of Oklahoma Press. Edmonson, Munro S. (translator) (1982). The Ancient Future of the Itza : the Book of Chilam Balam of Tizimin. Austin: University of Texas Press. Edmonson, Munro S. (translator) (1986). Heaven Born Merida and Its Destiny : the Book of Chilam Balam of Chumayel. Austin: University of Texas Press. Gubler, Ruth, and David Bolles (translators) (2000). The Book of Chilam Balam of Na. Lancaster (CA): Labyrinthos. Gunsenheimer, Antje, Tsubasa Okoshi Harada and John F. Chuchiak (2009). Yucatec Maya literature in a diachronic perspective = Texto y contexto : la literatura Maya Yucateca en perspectiva diacrónica. Bonner Amerikanistische Studien, 47. Aachen: Shaker. Knowlton, Timothy (2010). Maya Creation Myths: Words and Worlds of the Chilam Balam. Boulder: University Press of Colorado. Luxton, Richard N. (translator), The (Chilam Balam) Book of Chumayel; The Counsel Book of the Yucatec Maya. California: Aegean Park Press, 1995. Luxton, Richard N. (translator), "The Book of the Chilam Balam of Tizimin." California: Aegean Park Press, 2010. Paxton, Merideth (2001). 'Books of Chilam Balam', in: Oxford Encyclopedia of Mesoamerican Cultures Vol. 1. Oxford: Oxford University Press. Restall, Matthew. Maya Conquistador. Boston: Beacon Press, 1998. Roys, Ralph L. (translator). The Book of Chilam Balam of Chumayel. Norman: University of Oklahoma Press, 1967.